Since I am still doing four trips a day to put drops in Mom's eye, I have to do things that I can either take with me when I stay there or stop and start. One of the things that I can take with me is my spinning wheel. 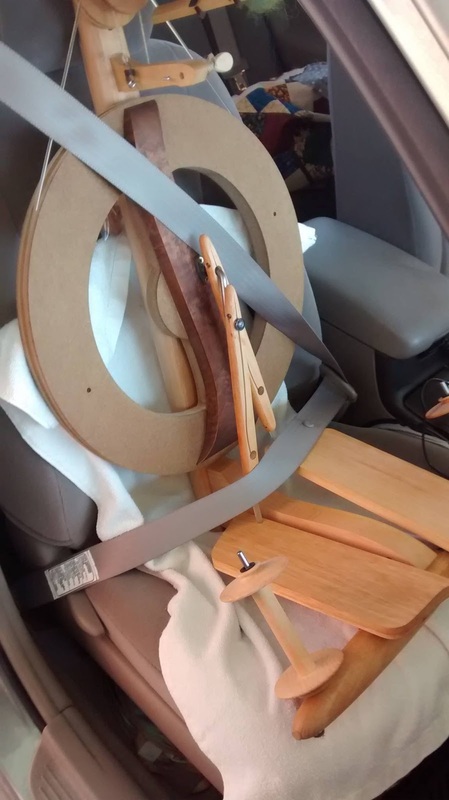 The one I have - a Kromski Fantasia- fits right in the car seat with the seatbelt to hold it in place. I had recently purchased some "waste silk" roving and some silk"cloud" to spin. So I packed up Meg (my spinning wheel) and the supplies and took them with me. 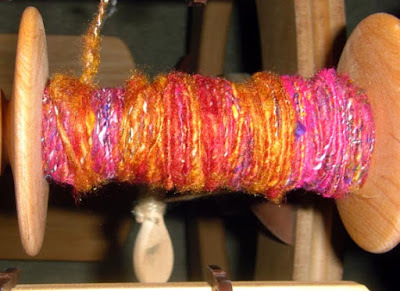 I had decided to core spin the silk onto a cotton yarn that I had in my stash. Here are the three of them together. The cone of yarn is black and white wrapped around each other or plied together. 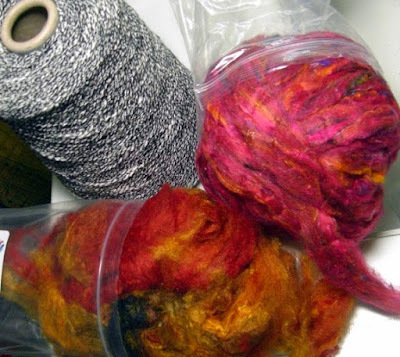 The pinker silk (right side) is the "waste silk" and the red/gold/black is the silk cloud. I spun a nice bit of the silk around the core thread, but I still have plenty to work on. Here is my bobbin at the moment. This is a lot like spinning straw into gold. Perhaps you should call me "Rumpelstiltskin" - or not, I am not as devious as he was. Pink has never been one of my favorite colors but I am loving this combination. The black silk from the cloud hasn't shown up on this yet. But in some places I have left the core thread showing. That way there will be a little bit of black throughout the spun yarn. I also have some other silk fiber that I may add in also. I don't have a place at Mom's to set up my sewing, so you may be seeing a lot of fiber work for a couple of weeks. Very cool color combo :) Looks good together and the black will add more depth. When the thumbnail photo showed in my blog roll, I thought it was a toilet seat. Opening your post didn't help, but I laughed out loud when I found out it was your loom. All buckled in, no less! Still giggling. Love the glitzy yarn! Nice spinning wheel. Your 'gold' yarn is a great idea. Now that is a clever way to transport your tools :) The new silk is looking pretty...but I do like pink! The silk that you are spinning is just wonderful, how clever you are!!!! I transport my Majacraft Little Gem wheel that way too. What a dedicated son you are! I hope you don't have far to drive for each of these visits? The time for my Lasik eye surgery is quickly approaching (September 30) and I am SO excited. Like your mom I have been given a pretty intense schedule for eye drops. For the first week it's three different types of drops 3 - 4 times a day! Luckily for me I have no problem using eye drops on my own. The real challenge will be setting up a schedule that works and that I can remember! I think my iPhone "tasks" reminder may have to come into play.